At 18 June, the permanent representative of the Netherlands at FAO, her Excellency Mrs. Gerda Verburg, hosted a side event at the 38th FAO Ministers’ Conference in Rome. A panel with Clement Kofi Humado, Minister for Food and Agriculture in Ghana, John Atkin, Chief Operational Officer of Syngenta and Clayton Campanhola on behalf of the FAO reflected on the initiative. On behalf of the Dutch government, Roald Lapperre, deputy DG Agro of the Ministry of Economic Affairs explained the motives to launch this initiative. Ido Verhagen, projectmanager Access to Seeds Index presented the outline of the project. Mr. Clayton Campanhola opened the meeting by welcoming the Access to Seeds Index as an initiative to foster social responsibility of the international seed industry. He underlined the importance of the stakeholder dialogue in developing the Index. Mr. Campanhola saw the Access to Seeds Index side-event at the FAO Conference as a good step in this stakeholder dialogue process. Mr. Clement Kofi Humado and Mr. John Atkin welcomed the initiative but also expressed some concerns to address in developing the Index. 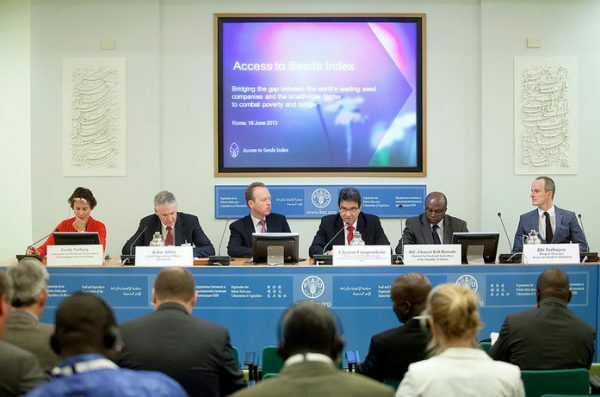 All side-notes, remarks and expectations will be used as input for the first Access to Seeds Index Round Table in Addis Ababa on 23-24 September, 2013.